The tennis stance is a very important element to any effective tennis hit. 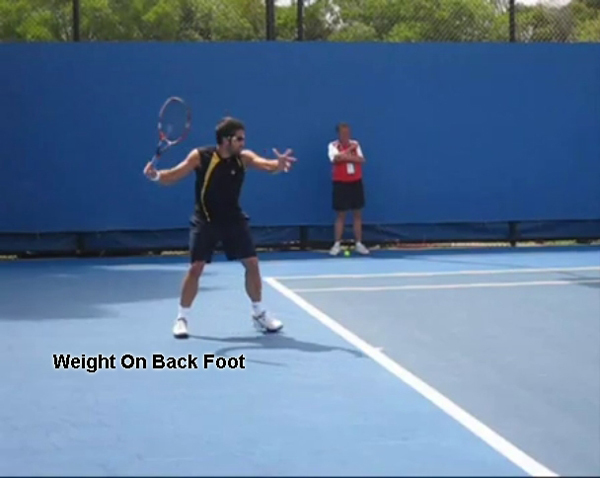 Whether hitting a forehand, backhand, volley or serve a proper stance is a must. A proper stance will give a player the most options on where to hit the ball, whereas an improper stance can severely limit where the ball can be hit and can also limit power and mess up a players balance. It can also make recovery much more inefficient by causing the player to take extra steps to recover back to a proper position to hit the next ball. 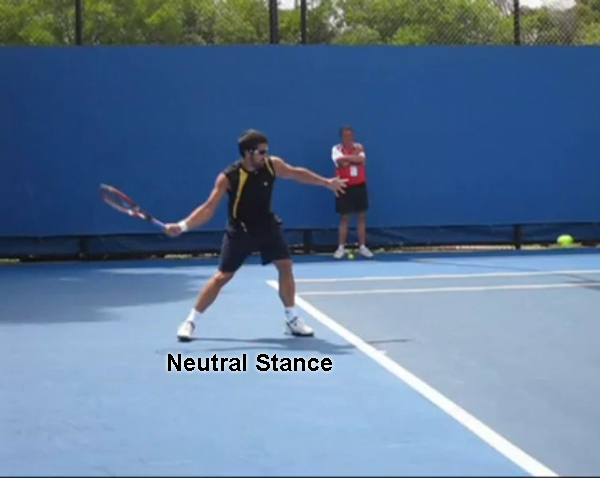 There are 3 main stances used in tennis. A closed stance, a neutral stance and an open stance. Several strokes have multiple stances that can and should be used whereas other shots only have one preferred stance. 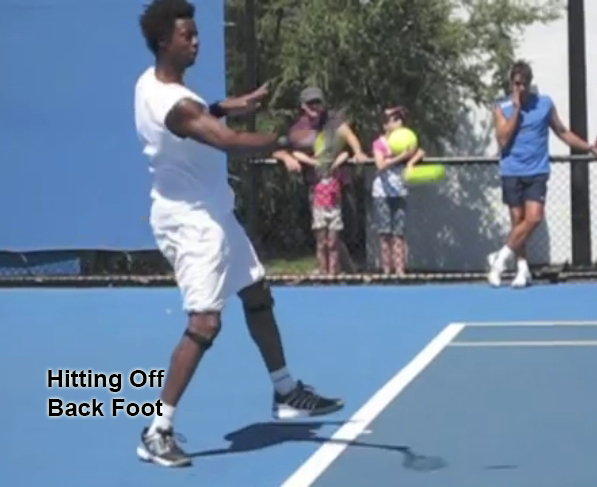 There are 3 possible ways to step into the ball while hitting a forehand. Two of the three ways are more advantageous then the third. 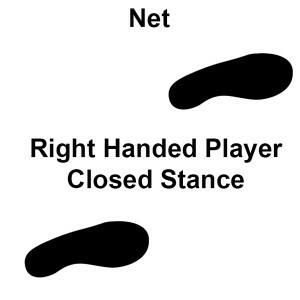 If we step to the right of our back foot we are in a closed stance. 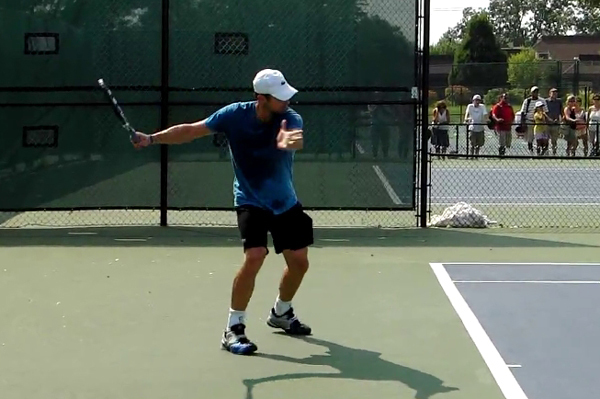 A closed stance is never a good stance to be in while hitting a forehand. A closed stance will not allow your right hip to sufficiently come forward severely inhibiting the power of the shot. It will also make recovery from the shot much more difficult as you will need to rotate your body further to get back into a proper position to hit the next ball. It will also make you take one to two extra steps for each shot then if using a neutral or open stance especially if forced to run out wide for a ball. The closed stance also makes it difficult to hit the ball to the left hand side. This makes it virtually impossible to get the ball crosscourt and maintain good balance throughout the shot. The only way to get the ball cross court with a closed stance is to move your back foot to the right as you are swinging. This will make it hard to maintain good balance which will increase the chance of missing the shot. Players who use closed stances also tend to jam themselves which generally means they will drop the racquet head well below the wrist. 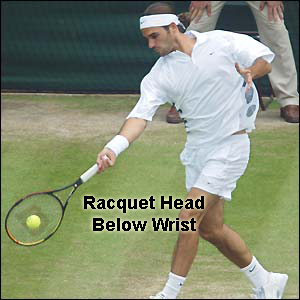 If the racquet gets below the wrist it is much harder to control the racquet head. The lower below the wrist, the harder it is to control. The less control a player has of the racquet head, the more likely they will miss the shot. Jammed players will also tend to bend the arm too much which will lower the overall circumference of the swing. This will limit the power of the shot. 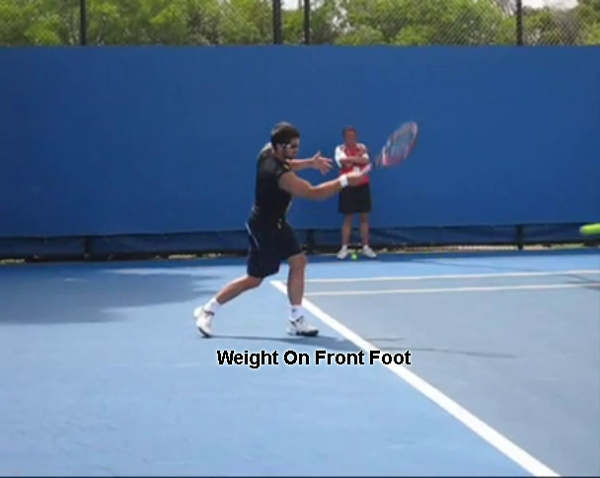 If the left foot is kept in the same position it was in after the unit turn or its moved further to the left of the back foot the player is in an open stance. Since many times the feet will not need to be moved any further to hit the ball, you can just transfer the weight from the right foot to the left foot while swinging. This is a good stance to use if you do not have time to step into the ball. This stance also works well if you are pulled out wide to hit the ball. It keeps the front foot from crossing over the back foot which leaves it one step closer to the middle of the court making recovery time much quicker. It is also a good option to use if you do not plan on coming to the net. 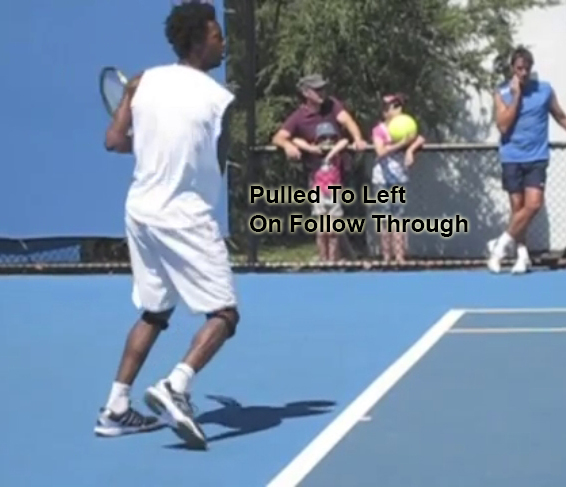 Due to the lateral momentum created by the open stance, an open stance can help to aid in the recovery by pulling the body back towards the middle of the court. It is also a good to use if you get to the ball late as it is much easier to hit off the back foot while still swinging fully. 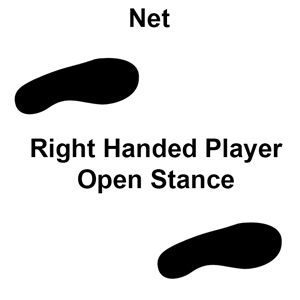 The problems with the open stance are numerous and I do not recommend using this stance unless you are a more advanced player or you do not have enough time to get into a neutral stance. There is a tendency to swing horizontally since the stance is facing the net instead of towards the side fence. This means the momentum of the player will be pulling them to the left instead of towards the net after they hit the ball. Hover over the below image to see this occur. This makes it very difficult for someone to play an attacking style and come forward (to the net). It will be very difficult to quickly stop the bodies momentum from moving left and to start moving forward before their opponent hits the next ball back to them. This is one reason why pros do not come to the net as much anymore as many pros use open stances most of the time. This pulling to the left will generally force non advanced players to swing horizontally instead of vertically and make them miss many more shots as they will not extend the racquet out towards the target for long enough. Also if they are playing someone who hits the ball really hard they may not have the time to turn their body and run to their right to hit a wide forehand if their body is pulling to the left. It will take much longer to turn that way then if they end up square to the net. Players are also less likely to transfer their weight forward since they do not need to step. Oftentimes they will just hit off the back foot meaning they will lose a huge power source (forward weight transfer). It is also difficult for some players to hit the ball to the right from an open stance as their momentum will pull the ball to the left somewhat. This is not a problem if you track out correctly and keep your swing vertical, but once again this is hard to do unless you have already mastered the forehand. Truthfully, for almost all recreational players, there is no need to hit open stance as they rarely play against opponents who hit the ball so hard that they don’t have sufficient time to get into a neutral stance. The benefits of the open stance for this level of player does not outweigh the drawbacks of it. A neutral stance is one where the front foot is even with the back foot. This is the optimal stance for attacking players and gives the most options to any player. A neutral stance allows the weight to come forward as the player swings instead of to their left. Hover over the image to see Roger Federer using a neutral stance to get forward towards the net. Notice how much further into the court a neutral stance gets a player compared to being pulled to the left with an open stance. This gives a much more natural and easy to use power source as the weight will start shifting forward during and after the step. Hover over the below image to see the weight shifting forward. Transferring the weight forward in the direction of where the ball is going will give a much more powerful shot then if the weight shift is to the left away from where the ball is going like typically happens with an open stance. It also is better for getting to the net since the players weight will already be moving in that direction. as the body is not inhibiting the swing in any way. There are two main drawback of the neutral stance. It is not always easy to step forward if someone hits the ball hard. It is oftentimes easier to keep the front foot where it is and just swing as this takes much less time then stepping forward. It is also not a good stance to use if pulled out really wide for the ball as an extra step or two will need to be taken to recover and and extra step is needed to hit the ball. 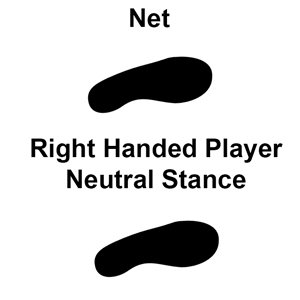 For these reasons I recommend learning the neutral stance first, then, as you get more advanced and play people who hit the ball harder or who are able to pull you out wide learn to hit the ball using both a neutral and open stance. All good players use both stances.